Men wearing jewelery has been condemned in the past especially during the time when society did not accept this practice. Although it has been shown in the history books that men of the earlier times did wear jewelery, it has become unacceptable in the succeeding eras. It was only in the mid-twentieth century that men wearing jewelery has become acceptable again as style icons such as musicians, celebrities, and sportsmen have started wearing jewelery as part of their packaging. There are different kinds of men’s jewelery available for one to choose from and these ranges from gold to silver to platinum and even leather. Most jewelery for men are almost similar to women’s as they come in bracelets, necklaces, rings, and yes, even earrings. Earrings as part of the men’s ensemble are probably one of the last pieces of jewelery for men that were accepted in the society because they were once thought to be largely for the female species. But now with the emergence of trends, earrings for men are widely accepted in the different parts of the world already. While men’s earrings can be made of different materials, the most recommended one is the one made out of silver. The metal silver used in the manufacture for these earrings are alloyed with copper to create a more durable material called sterling. Although not purely silver, sterling is one very workable material that is perfect when creating men’s earrings. Aside from the materials used to make silver earrings, it is also important to note that there are two types of earrings commonly used by men, and these are the stud earrings and hoop earrings. A stud earring is just like a single dot that one can see adorning the ears of men. This stud can consist of precious stones such as diamonds. 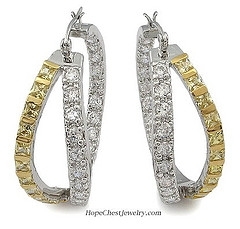 Hoop earrings; on the other hand, is formed like a ring that is hanged on the lower part of the outer ear. There are different types of silver hoop earrings that one can choose from since these earrings do not just come in plain forms but also in the many different designs there is. One such design is the double hoop earrings which are made by two overlapping hoops to create an earring that is held in place by latch backs. Another design of silver hoop earrings is the huggie which is a thicker version of the usual hoop earring. This type of hoop earring is very simple yet elegant. Other wonderful designs of hoop earrings are those that consist of two or more metals in its make such as gold and silver, platinum and gold, titanium and gold, and all the other variations these selections can make. One does not have to worry when choosing the right silver hoop earrings for his facial frame since most of these earrings are designed to fit just about anyone. The choice for hoop earrings is also countless especially in shops that offer jewelery online like Homme Rock since these shops make sure to bring business to their clients in the most professional way. Â© 2008 Jason Tye. Jason Tye is the webmaster and owner of the mens jewelry emporium – homme rock, specializing in quality, designer jewelry and rings, for men. This entry was posted in Glittering Diamonds and tagged hoop, huggie, wishlist, _diamond_flower_earrings, _diamond_gold_earrings_ on December 26, 2009 by admin. You’ll see the apps installed under ‘Installed Apps. a number of different big-name security companies by now offer mobile-security solutions, which several of them are free. This Android download manager allows you to download virtually any file from the Internet to your SD card.